SUPPORT THE PARKINSON'S DISEASE EDUCATION & RESEARCH PROGRAMME "OUT-THINKING PARKINSON'S"
Help accelerate the development of pragmatic and practical solutions for people with Parkinson's Disease and caregivers, from the insider's perspective. Dedicated to finding working solutions for people suffering from Parkinson’s Disease all over the world. Through self-experimentation (I have early onset PD myself), and joined-up research, I’ve been able to innovate and develop impactful quality of life interventions which people with PD are finding beneficial. Using these, I have made good progress towards my own progressive symptom reduction, bringing hope back to so many people around the world. I have gathered a large number of testimonials for this work, which shows that the research and education outcomes are indeed helping many others regain their quality of life too. I created and maintain a website/blog www.outthinkingparkinsons.com, in order to share freely all the research, and to make the results, outcomes and ideas generated open access for everyone. I’ve never charged anyone, ever, to access the information and knowledge amassed and never will. I also freely contribute to other forums, including the major independent information sharing project “Parkinson’s People ” . However, I need to generate some funding for this work in order to sustainably continue the research & education programme, as it has now become a full time effort: essentially, this is now my job/career - albeit unpaid! As well as the substanial time I spend on desktop research, sharing and translating science and providing new understandings about the disease via the website and social media, including engaging and helping to develop other Parkinson's forums, it has become quite expensive to continually test out supplement protocols, develop PD focussed movement recovery therapies, and especially to keep trialling and reporting on the effectiveness of new devices and assistive technologies. It is my hope that I will be able to cover this funding gap by appealing directly to the people around the world I help, via this crowdfund. The current funding milestone is set at £5000. Please support the Out-Thinking Parkinson's Fund! Dr Gary Sharpe, Phd, is a scientist and engineer by background, diagnosed with Early Onset Parkinson's Disease in 2009. After six years of dying inside, he started "Out-Thinking Parkinson's" in January 2016 in order to pursue pragmatic and practical solutions towards progressive symptom reduction for people with Parkinson's Disease. Today, Out-Thinking Parkinson's has become a major resource, where Gary and colleagues from around the world, who also have an insider's perspective of PD, share their knowledge, philosophies and experience of living well with PD, and, also, record their stories of recovery. Out-Thinking Parkinson's is a Psychoendoneuroimmunology based approach seeking to unlock the conundrums of Parkinson's Disease. We apply and test working hypothesis on Gary, observe and analyze the results. We then optimize the solutions which work and continually integrate new interventions. Progress is fully documented via a video diary. Information is freely shared for the benefit of all People affected by Parkinson's. All our interventions are non-medical, non-surgical and everything in our recipe for recovery can be implemented at home on a daily basis. Simply to stop the suffering of People with Parkinson's and their families as quickly as possible. We are not seeking to understand the microscopic details of the disease nor are we looking to develop the science over time scales of years. We are engineering the simplest and most effective solutions that we can find and then freely sharing and documenting our empirical results for anyone else to evaluate for themselves. We are focused on providing information and knowledge for everyone, including People affected by Parkinson's and those involved in their care, therapy and treatment, as well as education for the general public, students and the media. What's In It for People with Parkinson;s? Significant reductions in both symptoms and drug-induced side effects. Significant reduction in health and care costs. Having reached a point where Gary had recovered a lot of movement, balance, mental health and speech, together with much improved wellness generally, we began a second phase of Out-Thinking Parkinson's, based on further research which involves Gary seeking to lower his drug burden as much as possible. This was hard going in the initial stages, but using the evidence gathered in the first stage, we were able to show that it really is possible to reduce the drug burden and improve quality of life at the same time. By the end of this phase, Gary had weaned himself completely off of: ropinerole [a dopamine agonist drug]; amantadine [prescribed to counteract uncontrolled movement (dyskinesia) induced by the other medications]; Madopar dispersible [a fast acting form of l-dopa based drug] . He is now on standard Madopar (l-dopa) capsules only, and most nights he now sleeps through without having to take any drugs, allowing him to have an eight to ten hour "drug holiday". His dyskinesia is signifcantly better contolled. We continue to document the progress. We have now begun a third phase, having learned in the second stage so much about the role of malfunctions and dysregulations of the entire nervous systems (enteric, sympathetic, para-sympathetic, social engagement). Based on this understanding, we are now both educating as many other people affected by Parkinson's as we can about the Psychoendoneuroimmunological nature of PD, transfering the knowledge of what we've learned, as well as implementing - and having rapid success - with interventions based on these new understandings. A lot of hard work, dedication and intensive practice. Sticking to strict nutrional and supplement regimes. Changing inappropriate coping behaviours. Resolving physical and emotional traumas. Intensive movement therapies, performed with a spirit of Curiosity and Play. Consistency and persistence with supporting therapies, in particular strategic light therapy and music & dance therapy. The desire to be a calmer, more frivolous, more fulfilled person than who you were before Parkinson's manifested. Nothing. The website is free and open access. The only means of support is via this Crowdfunding Appeal, which we simply ask people who have found our work helpful to consider contributing to. You can subscribe to our social media channels or sign up to our website notifications, but the best way is to join our Facebook Group and ensure Group Notifications are switched on. I have included a new update as the new "cover" video for the "Out-Thinking Parkinson's" crowdfund, which demonstrates the year-or-year progessive reduction in symptoms achieved. Please support and share. Thank you so much to Margaret Yo​ for generously supporting me through a monthly contribution. May I ask previous contributors, whom may have benefitted from my work on Out-Thinking Parkinson's​ already, or anyone who feels it is worthwhile, whether they too might consider putting just a little something aside each month to help me keep this crowdfunding campaign alive and kicking? I am currently making a series of "one minute" educational films about and for people with Parkinson's. An example is attached. These are proving very popular and hence I would like to be able to make many more. Thank you so very much to all the contributors who have helped me reach my second milestone. 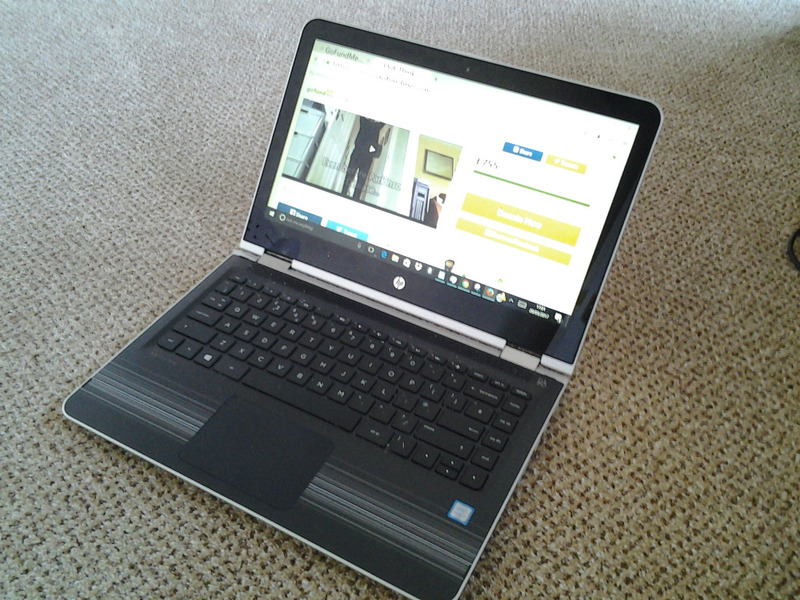 Here is the laptop I have purchased through your support for me to do my Out-Thinking Parkinson's project work on. It is touchscreen and can be used both in laptop and tablet modes, which helps as my symptoms wax and wane through the day. Thank you to all the 14 contributors who have donated an amazing £405 already, taking me halfway to my second milestone. Please continue to support me to be able to keep on "Out-Thinking Parkinson's" for another year!? Audio of my blog "How to Love and Care..
Good luck Gary. I hope you receive the funds you need to continue with the amazing, informative, supportive and inspirational work you have done so far. I appreciate your drive and persistence in healing, as well as the range of your research. What you are uncovering about trauma and the nervous system is useful to so many and makes sense of so much. Thank you. Wishing you much success on this important journey!